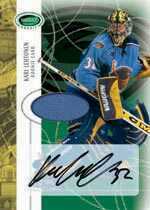 2003-04 Parkhurst Rookie features every Rookie Card from 2003-04 including a number of exclusives as well as a Jersey Autograph Rookie Card of goaltending sensation Kari Lehtonen numbered out of 100. This is certain to emerge as his most desirable Rookie Card in the market. 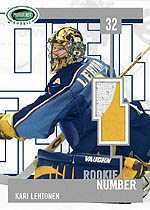 2003-04 Parkhurst Rookie is a product with tremendous investment potential. Look for the most attractive Game-Used Memorabilia Cards in the hobby. There are RARE GOLD VERSIONS of every memorabilia insert. Many will also be available in Autograph versions! 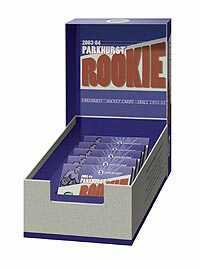 2003-04 Parkhurst Rookie is unlike any other set we have ever produced. Ask your local card shop or dealer about how to acquire the sleeper set of the year! Dealers, wholesalers and distributors can contact our V.P. of Sales, David Wasserman at (856) 439-1214 to place your orders. Additional details can be found on our web site at www.baptradingcards.com. Remember the 2002-03 Memorabilia Series Update set? Don't let this one slip through your fingers!